Sunday 26th saw the first reported sailing of the Bretagne the old flagship ferry of Brittany Ferries. The boat has now replaced Pont Avon on her sailings between Plymouth and Santander while Pont Avon goes on for her refit. The boat will also run at times in tandem with Pont L’Abbe until Pont Avon’s return early next year. Sorry I haven't posted for a while. I've been very busy with other things at the moment. The 17th November 2007 saw two boys life long dreams came to life with the chance to drive ex-Devon General/First Open top Bristol VRT VDV 142S. She was also in her lifetime in service known as Lawrence of Arabia, 39942 and 942 when with Devon General. She was built in 1978 and acquired by the Western National Omnibus company until 1983 where she passed into the hands of Southern National who renamed her Lawrence of Arabia as were all other open top VRTs. In 2001 she was bought by First Hampshire and Dorset and was used in Weymouth as the Harbour Sights open top tour bus until 2006. She was then brought into preservation by Terry Partridge. The bus uses the Standard Gardener 6LXB engine and can carry 76 passengers. Being an open topper she is slightly lower and wider than the standard VR at 13foot high and 9foot wide. If I am correct she is chassis number 22429 from a batch of 8 bought at the time. So on the Saturday Terry invited myself and Jon Harris up to a disused airfield at Winkleigh to come and have a go of driving our dream of a Bristol VR. At first we didn’t believe what he had said. Us driving a 9 ton Bristol VRT! Well he was serious and so we went up there me with him from Saltash as he is a local man and Jon by himself. We reached Winkleigh around 11:15 and we had a look around the more restricted areas of the site before going up to start the beast that Is VDV 142S. She roared into life first time and we gave her a few minutes to build up air pressure in the all important brakes don’t want them failing. As soon as the pressure was above 80 Terry set her off and showed us the course we would do and abut the controls of the bus where to watch out on the course and so on. Then it was our turn. Jon went first around the course very gingerly first In order to just get used to the VR. When I got in I was actually very surprised how easy the bus was to drive, the steering was a lot lighter than I expected and the gearbox was very easy to operate. A very good bus to drive and I now really appreciate why this iconic bus was loved so much by so many people. We drove round and round up and down in and out the whole 3 hours we were there we didn’t stop and the VR stayed loyal to us the whole time not one mishap. What a bus. Now I just need my own. Sorry I haven't posted for a while I have been busy. 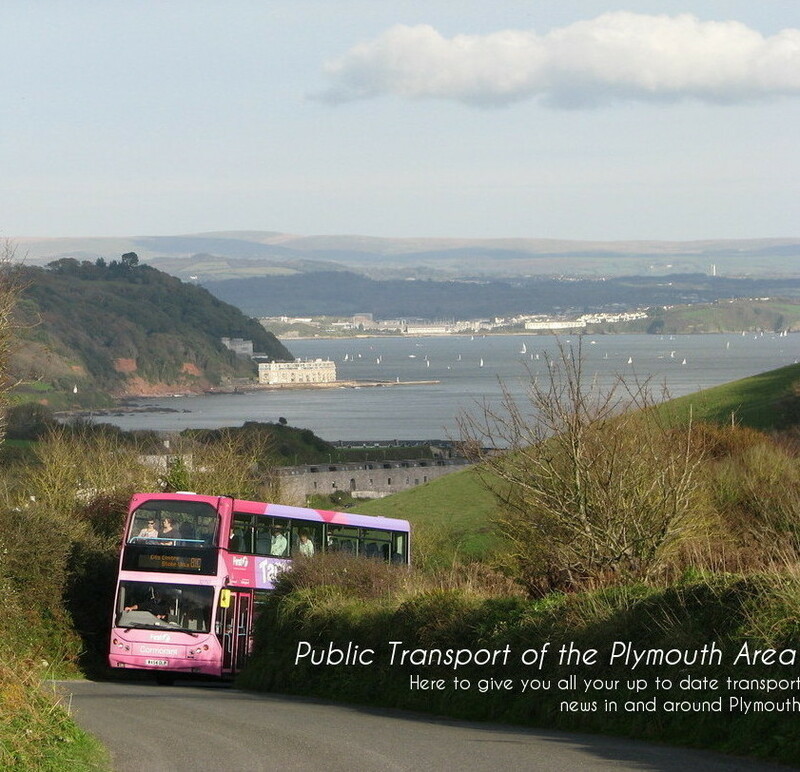 Recently First Devon and Cornwall has won the bid to take over all the retendered routes from Plymouth Citybus that have been given away. First Devon and Cornwall were only going to get a few the rest to Target Travel but they are all now going to First Devon and Cornwall. These routes will be 10, 13, 18, 30, 34B(not 34) 38, 44B (not 44) and 46B (not 46). If any of these apply to you please consult me for more information on the changes that will be taking place on your local route. The changes to your timetables and route operator will be taking place on Sunday 30th December this year just in time for the new year though there will Sunday operation the next day then no operation the next and then Sunday operation the day after that. These changes will be permanent and not short term as Plymouth City Council is currently trying to cut back on costs related to Plymouth Citybus therefore retendeing them seemed the best option for them to do. The timetables will be revised so if these routes apply to you please check the First Devon and Cornwall website which is www.firstgroup.com. The new timetables will be published in the near future there under the section “New Timetables”. The changes will also mean that the fairs will increase and certain passengers will no longer be able to buy return journeys for the routes as they could be operated by different companies at different times. "Here at the Transport Week, we have received numerous complaints about our magazine. Unfortunately, it is not actually our magazine. 'PTOTPA', or 'Cor-Dev' as it is known as now, bears a remarkable similarity to Transport Week. I would like to take this opportunity to advise all readers that it is not the same magazine. We retain strict editorial independence. For all your up to date transport news, go to www.transportweek.blogspot.com. Any opinions, articles, or photographs featured in 'COR-DEV', are not the responsibility of the Transport Week in any way, so any copyright issues reside with 'COR-DEV' (leave a comment at this blog, if need be). Subscriptions to the Transport Week, are available by emailing me. Please see our blog for further announcements. Taken this moring is Leyland Olympian 34812 on the school holiday only 81C 07:59 service to Derriford driven by Karl this moring. Plenty of time to talk to him and take some pictures when the bus arrives with a 30 minuite gap until the Cremyll Ferry departs. Lately with the timetable change and improved frequency of the 83 has been causing major confusion for the commuters of the route. 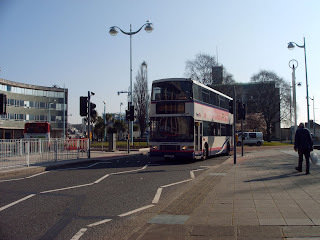 On Tuesday the driver had on the blind 83 but then changed to an 86 therefore went towards the railway station meaning commuters to Devonport had to walk from the railway station mainly to Devonport High School For Boys as that was the popular school route. 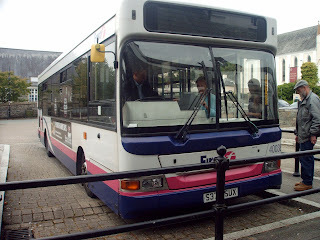 This also means 86 goes into Derriford "An uneeded journey" says Danial Chalinor as no body got off or on. He says that this should be left to travelers on the 83 not the 86. Then on Wednesday the bus did not arrive to pick the boys up until 5:30 some 30 minuites late meaning some very un happy pupils and parents. They say with all this new rebranding and more frequent buses has acctually made the route less reliable.